If you read my blog frequently, you know that we LOVE yogurt in my house!! Recently, we were sent two coupons for free YoBaby yogurt. I chose the Vanilla and Apple flavors. Yes, even though the name of this yogurt is "YoBaby", we don't care! Yogurt, in my eyes, is good for everyone! We enjoyed both of these flavors of yogurt and will most definitely try some more! YoBaby yogurts are made with all natural, certified organic products. But do you know what organic means? Organic refers to the way agricultural products (food and fiber) are grown and processed. It is an ecological system that at its core relies on a healthy rich soil to produce strong plants that resist pests and diseases. * Organic farming prohibits the use of toxic and persistent chemicals in favor of more "earth-friendly" practices that work in harmony with nature. * In the case of livestock, antibiotics are prohibited, opting instead for preventative measures for keeping animals healthy and productive. * Organic production also prohibits the use of genetically modified organisms (GMO's). * Crop rotation, which involves alternating the types of crops grown in each field, which in turn prevents the depletion of the soil. Pests are also managed through crop rotation by eliminating breeding grounds built year after year with a continuous crop. * Planting cover crops, such as clover adds nutrients to the soil, prevents weeds, and increases organic matter in the soil. Soil with high organic matter resists erosion and holds water better, requiring less irrigation. * Releasing beneficial insects to prey on pests helps to eliminate the need for chemical insecticides that can remain in the soil for years or leach into our water supply. * Preventing illness and maintaining strong animals through good nutrition and minimal stress are key to successful organic livestock farming. YoBaby yogurts are made with all natural, certified organic ingredients including milk from cows that were fed organic feed and have not been treated with antibiotics or artificial growth hormones. All of the fruits and grains in YoBaby yogurts are grown without the use of toxic and persistent pesticides and chemical fertilizers. 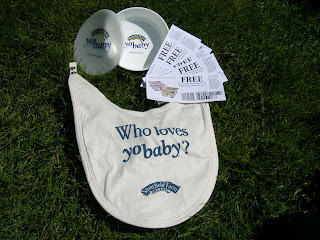 One lucky winner will win what's in the photo above: YoBaby bowl with lid, an organic YoBaby bib, and a bundle of 5 Free YoBaby coupons ! Remember to stop by Moody Mama Says and Everyday Baby Steps to enter one of their giveaways! *All giveaways for the Summer Soiree end on 7/12 unless otherwise noted.